Each subscription to the fiber club lasts 3 months (in this instance, May-July). 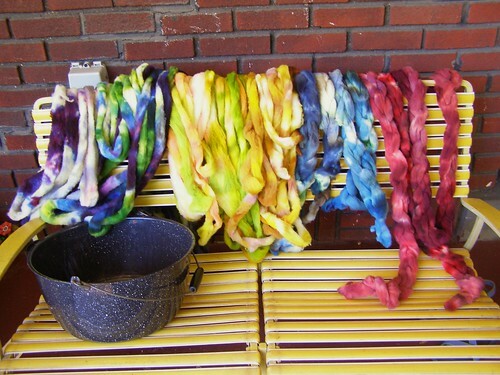 You get 4 oz of farm wool in an exclusive cosySpins colorway, hand dyed by me with Greener Shades Professional Acid Dyes*. Both the Shetland and the Shetland/Romney Blend come from a farm in Montana (my home state). This particular Shetland is from a light grey sheep with some darker hairs. I will be over-dyeing it. Shetland wool come from the historical Shetland sheep breed and is a down-type wool. It has a lot of personality, elasticity and loft. One of my favorite things about this wool is how it develops a fuzzy halo to around it when knit up and blocked or hand washed. This Romney comes from a farm in Pennsylvania (where I live now). Romney wool has well-defined crimp, a longish staple length, and a nice luster. A lot of people learn to spin on Romney. The Romney that I have has a bit more vegetable matter than I would like in it, but thus is farm wool. one spot left – it can be bought in my etsy shop over here. Your fiber will be mailed USPS 1st class between the 15th and 20th of each month. If you have chosen the pay monthly option, expect the bill between the 10th and 15th. I will only mail your shipment if you have paid. 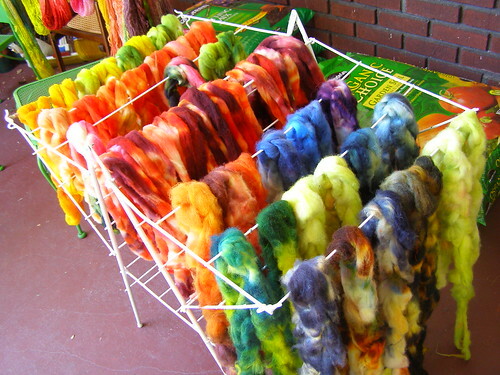 This entry was posted in cosyknitsliterally, cosyspins, dyeing, fiber club, spinning by cosymakes. Bookmark the permalink.